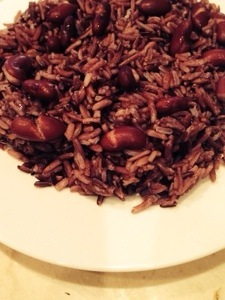 In my youth, my mother and father returned from dinner with friends with the most delicious recipe for red kidney beans using soy sauce. Having always loved that recipe, I decided to make something similar using red kidney beans, black rice, garlic, sesame oil and my alternative ingredient to regular soy sauce, Bragg Liquid Aminos. Bragg Liquid Aminos, a natural soy sauce alternative, is the most delicious and healthy soy sauce you’ll ever use. It’s gluten free, kosher, no alcohol, not fermented, no preservatives, non-GMO (approved by the Non-GMO Project) and contains 16 amino acids. It’s lower in sodium at 396 mg per teaspoon compared to low-sodium soy sauce at 575 mg and regular soy sauce at 920 mg per teaspoon. If you live locally (in Lawrence County, TN), you can purchase it at Duncan and Sons Market. Whole Foods and Earth Fare also carry Bragg. Bring rice and water to a boil. Remove from heat and cover undisturbed for 20-30 minutes. In a skillet, heat olive oil on medium high heat. Wait till heated. Add red beans. Once heated, add garlic. Stir for 1 minute. Add 1 tablespoon of Bragg Liquid Aminos. Stir till well combined and heated. Combine rice, beans and 1 tablespoon of Bragg Liquid Aminos. This side pairs well with chicken or fish. Serves 4.